As seen on Door to Door Organics! Dump quinoa and water into a saucepan and set to medium-high heat. Once it comes to a boil lower heat and cover. Check at 20 minutes. Once all water has been absorbed remove from heat and set aside. Prep green beans, carrots, asparagus and snap peas. Toss in glass casserole with a hearty drizzle of olive oil, sea salt and pepper. Mix to coat veggies directly in the casserole. Place in the preheated oven. Set timer for 20 minutes. At halfway give the veggies a stir. When done veggies will be cooked but have a little bite. Remove from heat and set aside. In a small saucepan bring a small amount of water to boil and steam the shelled fava beans. Steam for about 5 minutes. Drain and blanch by running under cold water. When veggies come out of the oven add the fava beans to the dish and mix. Meanwhile, in a small bowl whisk all sauce ingredients. Chop parsley. Fry your eggs. Typically I crack my eggs directly into a large, well oiled hot skillet 2 at a time. Then cover and let the heat and sputtering stay well contained. This also firms the yoke so check every minute to find your desired yoke consistency. 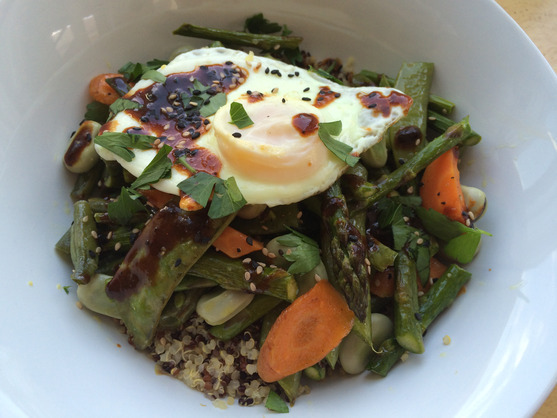 To serve, scoop quinoa into bowls and top with roasted vegetables. Sprinkle with parsley and top with eggs. Mix the honey, hot sauce, sesame oil, miso, and soy sauce together and drizzle desired amount into bowl. Yum!